3,4 - 4..........Bingo von Ellendonk. 5,4 - 4..........Satan von Ellendonk. 3 - 3.............Akim von Vaciweba. 5,4 - 4..........Blanka von der Au. 2001: 96-90-97 = 283 points (1st). 2000: 94-96-97 = 287 points (1st). 1999: 94-92-98 = 284 points (3rd). 1998: 45-96-98 = 239 points (26th). 2001: 75-96-92 = 263 points (51st). 1999: 98-81-96 = 275 points (15th). 1998: 98-91-97 = 286 points (4th). 1997: 96-85-94 = 275 points (3rd). 2001: 95-88-96 = 279 points (20th). 2000: 95-85-96 = 276 points (11th). 1999: 98-90-98 = 286 points (4th). 1998: 99-90-88 = 277 points (18th). 2000: 90-88-97 = 275 points (37th). 1999: 96-87-80 = 263 points (48th). 31/08/1997: 95-94-89 = 278 points (3rd). Erik vom Strundertal was the winner of the working IDC World Championship in 2000 and 2001. He passed the ZTP with 1A rating for character and SG for conformation and lived to 9¾ years of age. Erik's dam, Hexe von der Mooreiche, passed the Körung with Körklasse 2B rating. His sire, Ijanko von der Klingenstadt, is out of the same combination that produced Gina von der Weyermühle and Gero von der Weyermühle. Hexe von der Mooreiche's dam, Bo von der Mooreiche, passed the Körung 'for life' with highest possible rating for hardness and working drives (middle sharpness) and her sire, Ali von Langenhorst, passed the Körung 'for life' with highest rating for hardness and working drives plus winner of numerous German and International show championships. Ijanko von der Klingenstadt's sire, Boris von der Weyermühle, passed the Körung with highest possible rating for hardness and working drives (middle sharpness) and his dam, Cleopatra von der Klingenstadt, has the same sire and dam as the legendary “A” litter Weyermühle. Wilma: IPO 3, and dam of Briska's “B” litter. Winnie: IPO 3, FPr 2 and passed the ZTP with 1B rating for character and G for conformation. She is dam of Briska's “A, D, Z” litters (Zarina). Urs: IPO 3 and passed the ZTP with 1A rating for character and SG for conformation plus winner of the Luxemburg show Championship. 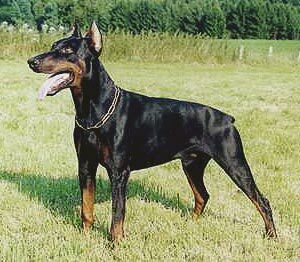 He is sire of the von Warringhof “C” litter and Briska's “C” litter. Kali: dam of the vom Blitzkrieger “O” litter (Orion).